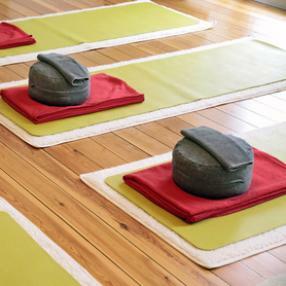 Warm Gentle Therapeutics Yoga is a restorative class and is the practice of entering Yoga postures in 90-95 degree heat using an assortment of props: blankets, bolsters, blocks, straps, walls, chairs, eye pillows etc. Supported and passive Yoga postures allow the body to naturally release, letting go of held tension and stress. With great precision you will be guided into position with a deep understanding of anatomy to restore healthy alignment. This support and stability invoke a restful state of healing,renewal and equanimity. Warm Gentle Therapeutics Yoga is a life enhancing practice and is appropriate for anyone at any age or stage of life and in any physical condition,especially those with specific ailments, issues and conditions, from pregnancy to scoliosis. Even those with an active, dynamic practice will benefit greatly from the inner peace, rejuvenation and deep release created through this style of yoga.